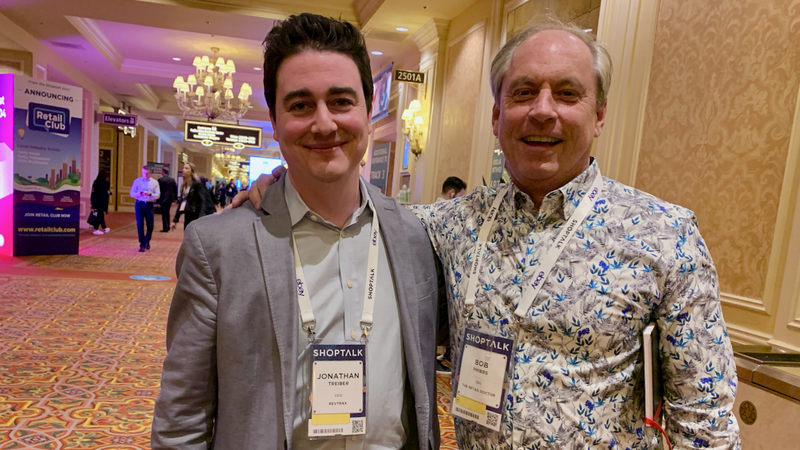 Bob Phibbs interviewed Jonathan Treiber, CEO and Co-Founder, RevTrax at Shoptalk in Las Vegas. Jonathan talks about how his company gets bodies into stores to make purchases and how he learned at an early age, it's about somebody other than me first. Bob: Today, we get to speak to Jonathan Treiber. Welcome, Jonathan. Bob: So tell me what is RevTrax. Bob: Wait a minute, but only a coupon works. I have to do more coupons. If I don't do coupons, they won't come in. Jonathan: That's true. The current thinking is that they need to do more of the right coupons. And ultimately, a lot of the brands that we work with are kinda sick and tired of doing the same old mass blast couponing that has potentially worked for them in the past, but is not as tailored to who their customers are and the different types of customers they have as they probably should. And they're getting pressure from their finance chief who's saying "Hey, we need to do less discounting." And so we represent a set of capabilities that can help them with their digital offers in their digital marketing to be more efficient. Bob: So I think Ron Johnson actually did get that right about JC Penney that it was overwhelming, the number of coupons that Penny's was doing on a regular basis. Let's say I am an a apparel retailer, a women's apparel retailer. Would I come to you and say, "I wanna target this sweater," or what I say, "I wanna target this woman," or how would it work? I have a promotion? Jonathan: Yes, sure. So you would say the conversation would be, you know, I'll use a good example of a client we recently did a case study with. They came to us and said, "We want to use our digital marketing efforts to acquire new customers and drive those new customers to purchase in our stores." Bob: Sounds like a great goal. Jonathan: And so they decided to use the resources that they put into search engine marketing and to affiliate marketing, which are, you know, pretty standard channels for most ecommerce. Bob: Well, explain affiliate marketing. Jonathan: Sure. Search engine marketing, simple pay-per-click ads, they're bidding on hundreds of thousands of search terms ranging from product level descriptions to competitive search terms. And they want people to click on those ads on Google. Affiliate marketing is actually much less well-understood by marketers. It's a term that's synonymous with performance marketing. Effectively what it enables a retailer marketer to do is to partner with thousands of web publishers that have eyeballs. And a lot of those web publishers, or loyalty programs, or coupon sites, or blogs that are putting out content, typically promotional content to consumers, and the way the deal works is you partner with those publishers. And if those publishers drive traffic to your site to make a purchase, you pay them a percentage. Jonathan: And so it's sort of low-risk advertising. And it typically drives pretty high ROI. 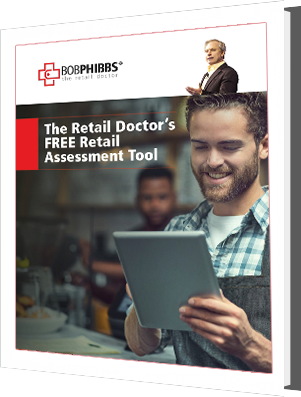 The big thing that retailers increasingly wanna do is to leverage that channel to drive in-store sales with measurability. Bob: Because if I just get you to come to the site, it doesn't really give me anything. Jonathan: It may give you a purchase, but typically most retailers find that the AOV is higher in store than online, the assortment might be better, the experience might be better. Bob: So now, I'm willing to say that's a chunk of money that you're willing to take away from going through and paying for all that stuff with Google, as well as all those affiliate sites and say...well, you still gotta do the affiliate sites, but now, you're do it at a different way. So how does it differ? Jonathan: Yes. So it differs because a client who's spending a lot of money on Google, a lot of money on affiliate, the big change is they may be...that they're extending an in-store offer to that customer. So when you're clicking on "blue shirt" on Google and you land on Men's Warehouse, Men's Warehouse through RevTrax technology is serving you a specific discount offer to be redeemed in their stores. So you go through search, you click, you see the offer, you activate it, and then you redeem it in the physical store. And our unique secret sauce is that we've developed a way to take all that digital information like what you searched on, and be able to combine it with a uniquely generated bar code that gets on your offer. Bob: So that's how you track it. Jonathan: That's how we track it. So now, the redemption happens in store, you just bought three items including a tuxedo, and you spend $400, we get a redemption file back and TLOG file back that we can then marry back to, "Hey, this unique purchase for this amount of these items came from somebody searching on Google on Tuesday at 3 p.m. for a blue shirt." Bob: So I guess this is something you probably don't want me to ask about. So how does GDPR gonna fit in all this? Bob: They'd rather have gone after me by name. Jonathan: Correct. So in this world of customer acquisition marketing, they don't know who you are until you make a purchase. And all we're doing is facilitating that and accelerating the path to purchase to get you from an online search to the store to buy where it's been proven you'll buy 30% more. Bob: Thirty percent more, that's kind of impressive. Bob: Oh, my God, you're right there at the crash. Jonathan: Yes. 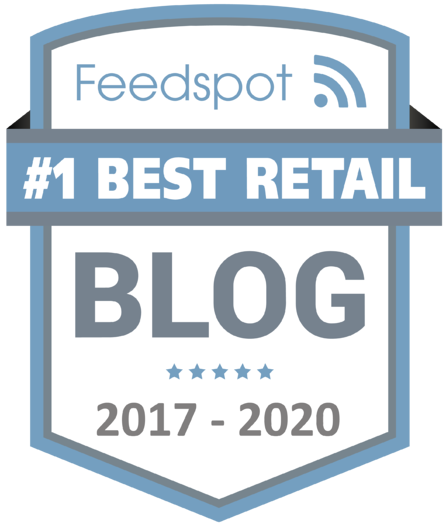 The big thing that we believed and it's been proven is the best customers for a retailer are the customers that buy in-store but originate online. Bob: Yes, I've heard that. Jonathan: Hands down. Why? Because, you know, although they're in the history books but, you know, Sims used to say, "An educated customer is the best customer." It actually rings true. People who are online searching, they're researching. They're doing things to show intent. And then if you can get them from the educated research standpoint, they're armed and dangerous. And if you can then drive that through a targeted incentive to fulfill it in store where you're going to get merchandising support and associate support, you're going to sell more. Jonathan: And so what our retailers found, which is awesome, is that by deploying RevTrax, they do three things. They reduce the amount of discounting they actually have done because instead of giving 20% off to everybody, they can give 10% off to these people, 15% here, 25% here, and do it intelligently so that overall, they're not discounting by 20%, they're discounting by 15%, right, average down. Bob: So everybody is just happy, CFO, etc. Jonathan: And the customer is happy because they're getting an offer that's theoretically unique to them. Bob: So is this the way we're going to do marketing, do you think? Are we going to be moving less from the...is the pay for click moving away? I know just as the Retail Doctor, I just...all that stuff with SEO words and everything, at some point, you just kind of throw your hands up. It's like, there's so many ways that you could spend money. But what really brings it to you. It's like that old adage, "Well, 50% works and 50% doesn't, I just don't know which is which." Those days seem to be gone, don't you think? Jonathan: I think so. And I think the good news is, is the retail industry is catching up because 10 years ago, we were probably a little too early here is retailers are realizing that, you know, online customers are not their best customers, right? It's that omnichannel approach, which was a term ironically that didn't exist when we started our business. So all we're trying to do is tap into the flow of customers that are online, but may not buy online. They may browse online, on a Men's Warehouse website, right, it's an online catalog. Bob: Well, we start online. They say 97% people start online. Jonathan: That's right. And the in-store purchase has proven out is a lot more profitable for the retailer. Bob: Well, see, I think what's so cool about that is online returns are, like, 30% and 40%, whereas in-store, like, 6% to 10%. Bob: So the numbers, if you just get me to the store to your point, I've gone through more to get there, right? And I really raised my hand to say, "I'm committed to doing this because I'm gonna go through traffic, and rain, and snow, and everything, find a place to park. I'm gonna roll the dice that when I walk in, I'm gonna be treated well," that it's much more likely that they'll hold on that rather than, "What the hell? I clicked the button. Ah, they got free shipping both ways. Oh, they got a 50 minimum. And let's buy three of them. What do I care?," and return two or three. That seems to be the bigger problem of retails. That's not you but that's the bigger problem retail is ignoring, which is the huge return problems with online. I mean, it's overwhelming. Jonathan: It's a big deal. And I think it plagues certain categories more than others. But what we've also seen, and this is a big deal too, that a lot of senior retail leaders are still questioning the impact that their digital investments have on driving in-store sales. So the connection between, I spend $10 million, $50 million, or $100 million a year online marketing, I know what it drives in terms of ecommerce... but I don't know what it drives in-store. We are directly connecting it. Bob: There's your secret code. Jonathan: But now, doing it through software, through digital marketing, and providing that direct line of sight in terms of somebody searched on this thing, click, and they bought in-store for this amount of stuff, provides visibility and accountability that a lot of retail CMO, CEOs are continuing to clamor for. Bob: They're desperate for it. Yes, they need that, to get on that. So let's go back. So how did you get started? And I know you have a connection to retail, or to restaurant, or hospitality, something, how did you get going? Jonathan: It was a summer job in high school. I did it for a couple years. And it was eye-opening. So it was a restaurant, a seafood restaurant that was in the neighboring town from where I've grown up. Bob: Okay. So where are we? What state are we? Jonathan: We're in New York. And it's... Dare I say the name of the restaurant? Eastchester Fish Gourmet, in Eastchester New York. And it's a high-end seafood restaurant. Really good, really popular, and expensive. The side of the business though, and they expanded from the retail business into...well, still retail, but catering. So the catering job was the job I had for two summers. And what was eye-opening about it was everything you'd imagine, all the shenanigans happening, you know, behind the scenes in terms of getting ready for a clambake for some, you know, some multimillionaire in a mansion somewhere, and you know, they're having 50 gas, or 100 gas, and the amount of prep that went in to making sure, you know, all the inventory of the items were necessary, that we loaded them onto the truck, that we had all the condiments. I remember, it was the first time and the eye-opening time that I realized that at least for the Eastchester Fish Gourmet, none of the Heinz ketchup bottles actually contain Heinz ketchup. Bob: How expensive could it be, right? Jonathan: Half the price or twice the price. Now, you'd have to question how many dollars are we really talking about. But to me, the insight was around the appeal for product quality sacrifice. So Heinz ketchup is better than the store-bought ketchup. So it's not a brand thing, it's a quality thing. They literally have said, "The profit margins are better if we put a subpar product in this and pass it off as something else." Bob: "And if they think they're eating it, then..."
Bob: Okay. I just have to stop you because it's funny you said that because when I was starting out, I remember I had a buddy of mine who was a cater in Los Angeles, same thing. And so I didn't have anything to do really on some nights and he said, "Oh, you wanna come do that?" Now mind you, it has to be a really good amount of money. Jonathan: It was a good money. Bob: It was good money. But I mean, I was like already doing great at my own job, got it? So I'm up there in Malibu one night and I'm helping, you know, settle the stuff and he goes, "You know, I just need somebody to help him with the park the car." So it's like, "Okay." So I helped this woman and like, "Oh, it's over here." And I hear it's whispered this other guy is like, "That poor guy working on Christmas Eve, or New Year's Eve. He must really need the money." And I laughed, it was like, "No," but it was very interesting to see when you're in the catering world, really how much customer service and how much setting the table has to do with it. And then the difference between being a guest in event and you appreciate all that goes behind it, but also it's serving others which is why the longtime listeners here in my second season, I always ask this question because you don't get on my podcast unless you have a connection that because, Jonathan, I think you learn at an early age, it's about somebody other than me first. Bob: And like that world, right? It's nice to see that pretty world. Bob: Off of their head. Jonathan: ...when I was 15, 16 years old and bite their head off, because it's not gonna make me feel any better, right? And in fact, I can make them feel 10 times better by being understanding. And so there's an empathy that I think is why you have the opinion you do, that you can be successful in business if you had a role in retail, and serving others, because it is something other than yourself, but it also teaches you lessons if you're open to learning them about how to treat people and how not to treat people. Bob: And without that, I think you're just another guy telling people, "You need my product." And at the end of the day, it's like there's a million other people I could choose why you. Bob: Because they haven't really understood my problem, which you've understood. So if you get like bogged down like the weight of the world's on you, that's like, "Oh, I just can't focus," what do you do to get your mojo back? Besides go to Shoptalk or something like that, what do you do to refocus or what gets you going again? Jonathan: On a personal level, I play heavy metal guitar. Bob: I'm a conductor actually. Jonathan: Music is my outlet. Music is my outlet. Bob: Is this in your garage, you're just going out to a band? Bob: I wouldn't have thought that in the least. Jonathan: ...and love it. And so it's an outlet, right? I do love jazz, I do love classical music, but I'd say music overall is my outlet. And, you know, I am a victim of Netflix, you know, TV show binge-watching every once in a while. I get sucked into a season or to a show, and it's an outlet that helps me get distracted from the day to day. Bob: Every night, I have to watch a movie. I don't care if it's Apple TV or Netflix, like, I need something not retail-based. I turn off the phones, like, "I don't want to comment about whatever Target did today or somebody else and take me out." And then I discover, like, this is amazing when you're like, "Okay. The next three nights, I'm just gonna be powering through it." And then season two comes and you're like, "Yes, it's not as good. I don't care about the dad, I care about her journey in New York." But it takes us out. That's my thing, is take me out into somebody else's journey. And it doesn't mean inspirational story, right? It's not like this victory over something horrible, just let me see what the normal person is going through rather. So I have a question I always end my interviews with. Tell me something great about retail. Jonathan: It is always changing. And the best news I feel about retail as we're sitting here today in Shoptalk is the pace of change has never been greater and necessary. And I think that that is what makes it exciting. Jonathan: I'll pitch a logo tee. Bob: I like that. I like that. Jonathan: Okay, okay. A follow-up item. Bob: How do we find out more about you and your company? Jonathan: Our website, www.revtrax.com or connect with me on LinkedIn. Pretty easy to find. Bob: Cool. And that's with an X not a C, K, X. So there you go. Thanks very much for joining us, Jonathan.